WARSAW – It’s been quite a weekend for Tippecanoe Valley football. After a Friday night for the ages, life went on Saturday and saw Valley notch another football win for the archives. 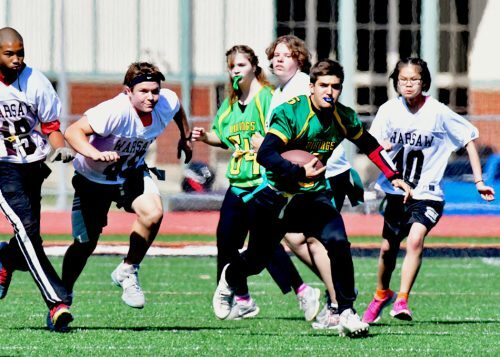 The first-ever running of Unified Flag Football had its sectional Saturday at Fisher Field in Warsaw. Valley did something a football program in Akron hasn’t done since 1992, hoist a sectional championship. 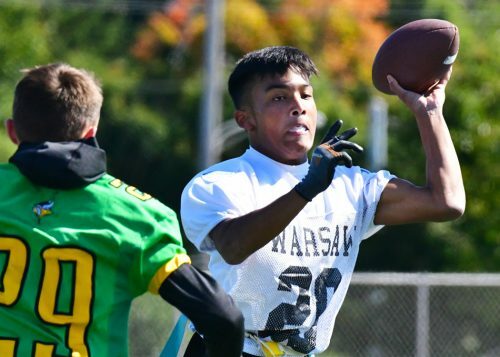 Valley put on an offensive showcase in blowing out Warsaw, 36-12, in the semi-finals, then came back and ran past Wawasee, 24-12, to claim the inaugural championship. With IHSAA Commissioner Bobby Cox looking on from the field, Valley started from the first whistle and just kept on going. Its first play from scrimmage saw Tanner Trippiedi take the ball and run 35 yards untouched for six. The two-point try was good, with Valley up immediately 8-0 on the Tigers. The Vikings would take a 16-6 lead into the half, Warsaw getting its first score of the tournament from Kendra Keene. A long run and score by Cade Brouyette put the Vikings out of reach and into the finals. 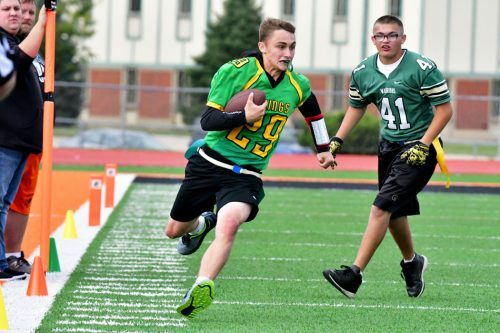 Connor Frentzel races down the sidelines en route to a touchdown for Tippecanoe Valley. On the opposite field, Wawasee did a number to the Goshen RedHawks. 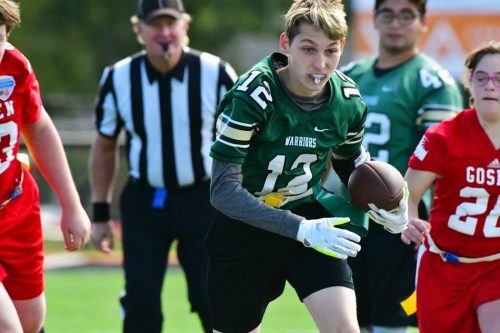 Carr Reinhard had a touchdown catch to help the Warriors to a 20-0 halftime lead, and Cam Mangun opened the second half with a long catch and run for a score. Shelby Bolt added a touchdown catch for the Warriors. Goshen’s lone score came on a long run by Jeremiah Close, but at 34-7, Wawasee had advanced to the championship game. The final had Trippiedi exhibit his pure speed. 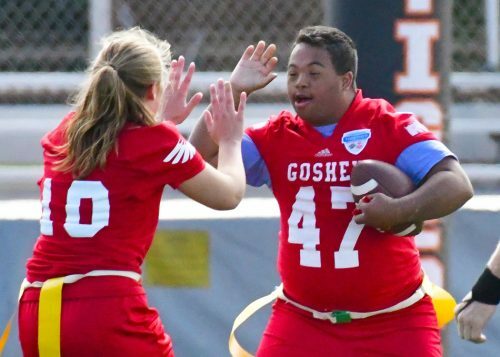 He scored on a catch and run, a rush, and another touchdown catch, the third with just 17 seconds to go in the half. Valley was up 18-0 at that point and looking pretty good. Preston Pruitt got Wawasee on the board with 9:38 to go, but any hope of a Warrior comeback ended when Connor Frentzel raced down the sidelines and through a pair of pull attempts to score for the Vikes. Jaydon Boyer would get a late score for the Warriors, but it wouldn’t stop Valley’s run to a sectional championship. 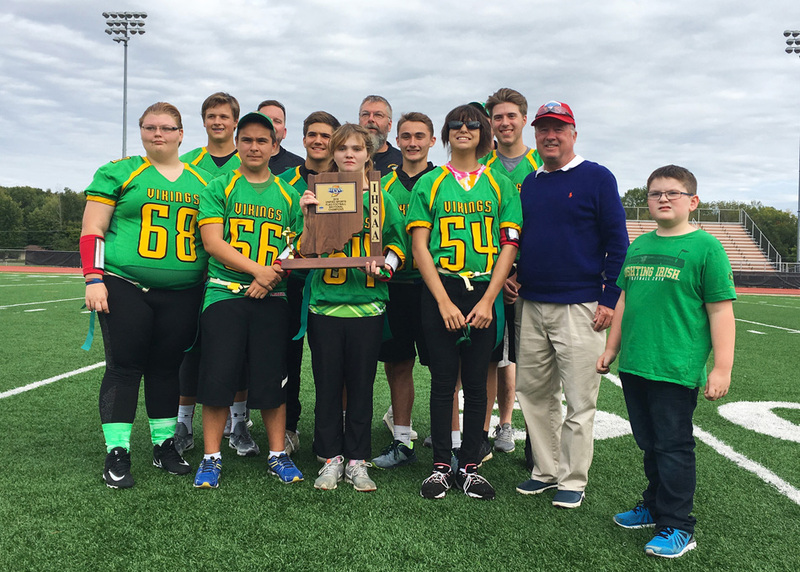 Tippecanoe Valley head coach Jeff Shriver, who has spent many a moon on the Valley football sidelines for much of the last two decades, was just as proud of his kids Saturday as any team on Friday night. Wawasee head coach Andrew Wilson offered similar sentiment in defeat, pointing to the introduction and the time spent in his team’s month together and five games, to which the Warriors bow out 4-1. Tippecanoe Valley (3-0) will host the regional next Saturday against Griffith, which advanced after a forfeit from LaVille. The Valley-Griffith winner will move onto the state finals on Oct. 13 in Indianapolis, where it will take on either Fort Wayne Carroll or Noblesville in the first championship semi-final. The south state bracket has Zionsville at Ben Davis and Bedford North Lawrence at Jasper in its two regionals next weekend. Warsaw’s Jacob Moeller versus Tippecanoe Valley. Goshen’s Jeremiah Close versus Wawasee. Wawasee’s Cam Mangun versus Goshen. Tippecanoe Valley’s Tanner Trippiedi versus Warsaw.